I just saw your youtube demo on hallux rigidus. I'm 54 yrs. old from the USA. I enjoy fencing 2-3 times per week and for the most part I think I am fairly healthy. However, In my past, I've been diagonosed with Crohns and been warned that arthritis is not uncommonly associated with this, which I minorly suffer from in my hands and lower back. Very recently within the past 4 months I've been diagonosed with hallux rigidus in my left foot- big toe. I also have just completed physical therapy due to tendonitis of the left archilles heel, and tendonitis of the right elbow . Am I lacking a certain nutrient/s? If you have any advice and/or recomendations, I would certainly appreciate it. Also, do you have a USA address for your products? When there is a digestive disorder such as Crohn's, the possibility arises of secondary disorders, including arthritis and various connective tissue problems, including tendonits. This is partly due to the poor digestion associated with Crohn's and the restriction of the diet to foods that are less likely to stir up the ailment. Take one lecithin oil capsule with each meal. Lecithin has many health benefits, including being a fat emulsifier and will assist the digestion and absorption of fat in the diet. Go back to entirely natural foods, avoiding anything that is fat reduced, has colourings, flavourings and preservatives. If you can not tolerate the natural form of the food then leave it out for the time-being. Avoid all refined sugars, flours, sports drinks, artificial sweeteners and fruit juices (Eat the whole fruit instead). Do not drink lots of water with your food which may reduce the effectiveness of the digestive juices. Ensure your diet is rich in pesticide free leafy greens, root crops, nuts, lentils, beans, fresh and dried fruit. One can assume that the fat soluble vitamins are seriously lacking due to Crohn's (a, d, e and k). Read my articles about vitamin K here and here. The best way to get vitamin D is from the midday sun, or else a supplement. Refer to my many articles about vitamin D here. Vitamin A is best gained from cod liver oil and vitamin E from a supplement. These are best taken with lecithin and a chicken broth. It may also be beneficial for health in general to take a natural vitamin B and vitamin C supplement. Take a course of probiotics to help ensure the gut is populated with healthy bacteria. Prepare a chicken broth and have 2-4 cups over the day. Get some chicken frames and simmer in a pot for a few hours. Add lentils, herbs, etc. The minerals and the gelatine nourish and soothe the gut wall and are highly nutritious generally. Have a dessert spoon of cottage cheese (full fat) mixed with flax oil about 6 times daily. This supplies the essential fatty acids and easy to digest protein. Refer here about the Budwig Oil Diet. Complete the Active Elements Assessment and use this to supply your specific mineral salts needs. Without exception everyone with Crohn's that I have had dealings with are vitamin D deficient. Please ask your doctor for a blood test of your vitamin D. Report the results to me for interpretation. of the most likely ones to give benefits and do a three month course, all the while looking for subtle signs of response. Depending on progress, one or two may be spelled and another one or two are added to the base mix. The idea is to take one's time - not to be impatient, not to chop and change willy-nilly and not to go for the big hits. nutrition a few weeks to kick in first so that the body has the capacity to heal properly. You can also get the joints of the hands and fingers mobilised while you are at it. It may be worthwhile to look at some alternatives to the fencing until well after the toes and tendonitis are fully healed. This is because the slamming of the toe from repeated lunging is just about the worst thing one can do for an impacted toe joint (Dancing in high heels, boxing fitness classes and toey distance running produce more than their fair share of this kind of injury). Try aqua-jogging for a while. Join a swimming squad and take swimming lessons. Get a bike and ride in the fresh air and sunshine. The tendonitis of the Achilles and other areas should settle once you get the nutrition going properly. In the meantime, the advice about exercise should be heeded to give the tendons time to settle and for the nutrition to work its magic. going to a part of the world where Crohn's does not exist and parking yourself there for a month or two. Stress is a controlable factor in these kinds of digestive tract disorders, as is diet. My advice is to adopt the local lifestyle and diet and see what happens. Having quite close connections myself with Samoa, I recommend that you get on a plane out there. Not to American Samoa which has been ruined by fast food and handouts; but to the islands of Upollu and Savaii. 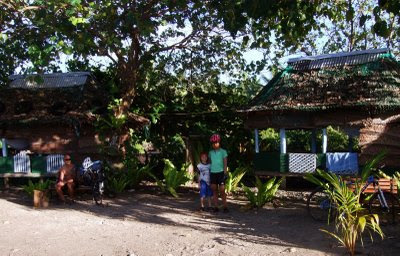 Go to a locally owned resort where you can live in a simple beachside Fale for about US$30 per day, including meals. Eat only locally grown foods, float in the lagoon and generally chill out. If there is a significant improvement in symptoms, stay longer and plan regular returns. Do I deliver to the USA? Yes! With exchange rates and tax deductions, delivery to the USA is an affordable daily exercise.